You won’t find many uses for this size, though it can be a lighter weight option for shorter swords. Its smaller diameter means it’s not appropriate for anything past 2′. 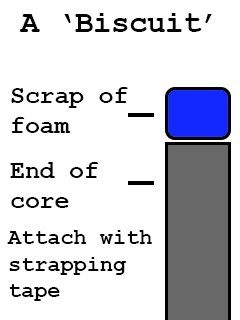 One core technique calls for taping two 3/8 rods together, but foamsmithing doesn’t advocate this option. This will be your go to core material. It can handle any weapon up to 48″ and even more in a lighter contact game. Most of foamsmithing.com’s tutorials are designed with .5″ fiberglass in mind. These diameters have similar properties and are almost interchangeable. This size core is best for 58″-60″ weapons. It can be hard to find these sizes though, as most retailers go directly from 1/2″ to 3/4″. For the record, Forged Foam constructs their two handed blade kits for 11/16″ cores. This makes for a pretty hefty core. We generally consider it too heavy for most weapons, though it could be of use in swinging polearms over 60″. Just be sure to pad the weapon well and build it safely. Most fiberglass rods are round, but square ones can be found as well. They tend to be stiffer than equivalent thickness round rods, and easier to work with too. They have more surface area contact with foam than round cores, so they’re more durable. A 1/2″ square rod can be good for red weapons up to 5′, and 3/8′ is good for most blue weapons. We recommend using square rods if you can obtain a good supply. Cutting fiberglass rods can present some problems, so you’ll want to be careful before taking a saw to one. Before you cut, put a layer of tape over the location as detailed here. We recommend strapping tape, but the exact type isn’t crucial. This will prevent the strands of fiberglass from splintering under the serrated saw teeth. Keep the tape on afterwards. You’ll also want to avoid inhaling any dust created when sawing, and keep it out of your eyes. Put a newspaper under your work area to catch any falling dust, and dispose of it when cutting is complete. This site has more detailed safety information. Sometimes fiberglass rods come with a sharpened point on one end to stick in the ground. You’ll need to cut that to a flat end, otherwise the core could punch through your foam one day and into your opponent. To prevent extra wear on the inside of your blades, it can be beneficial to tape down a “biscuit” of extra foam on the end of a weapon core. Cut a scrap of foam the same size as your diameter. Glue it on one side, wait a bit for it to tack up, then place it on the end of your core. 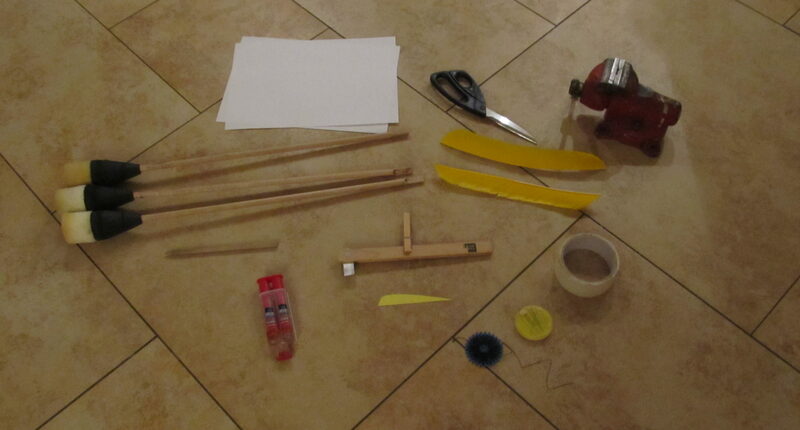 Tape over it with an ‘X’ of strapping tape, then another strip around the side of the whole assembly. Don’t put too much tape on, or else it will bulge out and interfere with your blade construction. Finding a local source is the ideal option, since you’ll save on shipping. Trying asking around your boffer group or try a google search (“fiberglass rods+city name”). They are sometimes carried by plastics stores, and sometimes sold as driveway markers. Our online experience comes from US retailers, so we can’t offer much advice for overseas options, sorry. We’ve had good success with TAP Plastics and heard nice things about Goodwinds, although neither carry 5/8, 11/16, or square rods. Max Gain Systems offers 5/8 rods among other sizes, but be sure to get them precut to save on oversize shipping. Farm and Fleet apparently sells an 11/16 fiberglass rod, but we haven’t purchased an example yet. If you’re willing to place a minimum order for 20′, Fiberglass Rods and Bars offers square profile fiberglass. The thicker the core, the more you can expect to spend. 3/8 is generally under $6 for a weapon’s worth of core, 1/2″ is generally under $10, the larger sizes are generally under $14 a core. Avoiding shipping costs can generally knock a few dollars off those figures. I have to disagree on the lengths you’re proposing the cores be used at. 3/8″ is probably fine up to 28″. 1/2″ is fine for anything up to 48″. Beyond that, 1/2″ min reds (two-handers) will flex out eventually, or last forever, depending on who you ask. 5/8″ or 11/16″ is a red core; there is no reason you -need- something that beastly for under 48″. If you do use it it will be heavy and hit hard. 3/4″ – there is no reason to use it for a core. It’s heavy and when you use it for longer weapons, the length will just emphasize the weight of the core. Bandshoppe pole should be used instead; it’s stronger, lighter, and costs less. In terms of cutting off the sharp bits of an ordered fiberglass rod, or even cutting off the club of a graphite core, I love using a good metal file. It takes it all off gradually so there is little to no tisk of splintering. Plus if by off chance the cut is unlevel you can just file the tip down flat again.